Another article in an occasional series of articles that appeared in FOW’s publications in the past and still resonate with us today. 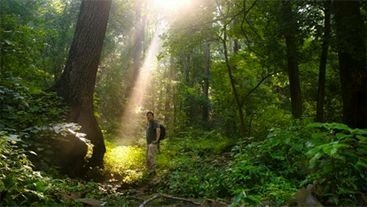 This piece was written by Sarah West, West is a long-time FOW member, former FOW Board Member, and a current Trail Ambassador. This article first appeared in FOW’s Fall 2008 newsletter. Although the Walnut Lane Bridge achieved international fame as the world’s longest concrete structure in 1908, there are many other notable bridges that have spanned the creek and its tributaries—bridges of wood, stone, and steel. Some of these bridges are familiar to us today, while others have been destroyed by floods, demolished as they became obsolete, or replaced by newer structures. Four covered bridges, the Pipe Bridge, the Hartwell Lane Bridge, two foot bridges across Devil’s Pool, and at the Old Log cabin Roadhouse are remembered only in historical records. 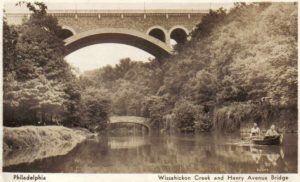 This article describes only six Wissahickon Bridges: the Henry Avenue, Hermit Lane, Blue Stone, and Kitchens Lane Bridges, as well as the lost and forgotten Hartwell Lane and Pipe Bridges. Henry Ave. and Hermit Lane Bridges. David Bower Postcard Collection. The Hermit Lane and Henry Avenue Bridges are fine examples of the lovely field stone and concrete bridges built between 1794 and 1931. They offer a striking contrast between small-scale and large-scale industry from two historical eras. 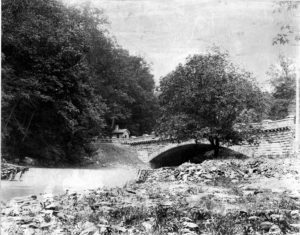 Until 1826, the busy Hermit Lane Bridge was the only direct entrance into the lower Wissahickon Valley. This small bridge connected Roxborough to the Nicholas Rittenhouse Paper Mill complex which became the Greenwood Mill in 1864. It also brought patrons to the Old Log Cabin Road House and its lovely arcade (arches) to picnic beneath. Close to Lover’s Leap, the Hermitage Estate, and the Kelpius Spring, this location was considered the most beautiful part of the Wissahickon. Planning for the Henry Avenue Bridge began in 1917, but encountered many obstacles. It was finally constructed in 1931-31. Dedicated to local men and women who served in World War I, this impressive span is 1080 feet long with an arch span of 291 feet. It carries a highway 60 feet wide. Plans for the bridge included a rapid transit train below the roadway, and a platform was built during its construction to serve as a station. In January 1931, the incomplete span sagged, arousing fear of collapse. 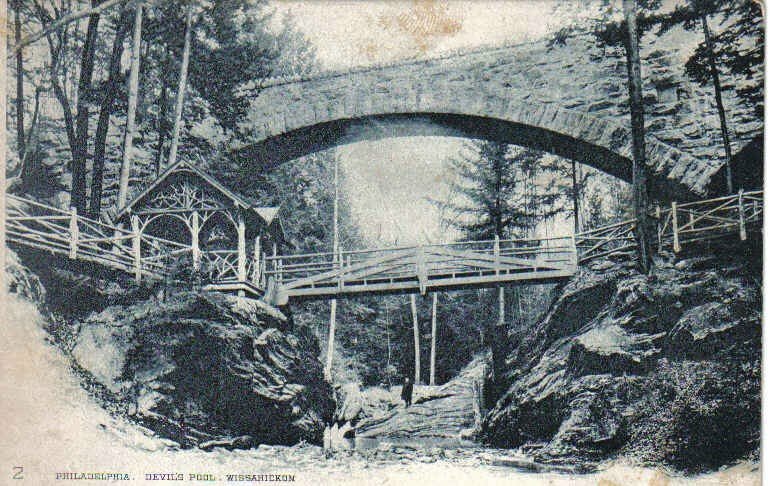 Blue Stone Bridge, 1904. Germantown Historical Society. Remembering the tragic accident during the Walnut Lane bridge construction, engineers closed Lincoln Drive for a month until the keystone was set. The Thomas Mill Road Covered Bridge is a charming sight to Wissahickon visitors and appears frequently in photographs, but in the nineteenth century at least four other covered bridges spanned the Wissahickon Creek, connecting communities on either side at Allens Lane, Kitchen’s Lane, Livezey Lane, and Shurs Lane. The Old Red Bridge at Shurs Lane was replaced by the Blue Stone Bridge in 1896. The road that went across it was not only the major route from Norristown to Germantown, but a by-pass route around Philadelphia on the Baltimore to New York route. The Crawford Stage Coach line ran across this bridge along a rough road close to the six-story Henry Rittenhouse Grist Mill. The Lotus Inn, one of seven road houses that served Wissahickon travelers, was located on Shurs Lane up-hill, just west of the bridge. This must have been one of the busiest locations along the Wissahickon. In 1908, after completion of the Walnut Lane Bridge, Shurs Lane was no long a major travel route and today’s traffic across the Blue Stone Bridge is limited to cyclists and pedestrians. Kitchens Lane Bridge with Trellis. Library Company of Philadelphia. Kitchens Lane Bridge, connecting Germantown with Roxborough, was the one most frequently damaged by floods, yet it provided an important connection between Roxborough and West Mt. Airy. By 1920 the bridge at the long abandoned mill site included a trellis, but it was battered by flooding, causing the trellis to deteriorate and necessitating the bridge’s removal. In the 1970s it was replaced by a much higher concrete bridge. 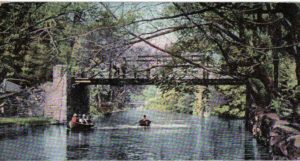 Hartwell Lane Bridge, 1900s. David Bower Postcard Collection. Just upstream from Valley Green Inn, the Hartwell Lane Bridge connected Hartwell Lane leading into Chestnut Hill with Wise’s Mill Road leading to Ridge Avenue in Roxborough. It also carried traffic going to and from the Megargee Paper Mill, which closed in 1884. The bridge was destroyed in a flood around 1929. For many years its two stone foundations stood as lonely sentinels, but dramatic flooding in1999 and 2004 reduced its remnants to rubble. 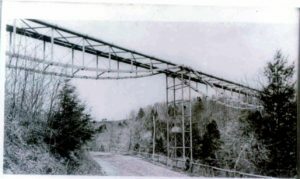 Pipe Bridge, 1890. Chestnut Hill Historical Society. On the west side of Wissahickon Creek, down stream from Livezey Dam, stands three piers from the old Pipe Bridge that carried water from the Shawmont Reservoirs in Roxborough to Mount Airy and Germantown from1870 to 1890. It was 691 feet long and rose to a height of 103 feet. The pipe bridge was not the best solution for water transport—its pipes froze in winter and split. By 1891 the bridge was declared unsafe, and water was rerouted under the creek through conduits that can still be seen in the stream bed. The J.W. Schultz Company, specializing in dismantling iron structures, bid to dynamite the bridge and sell its pipe for scrap. However, after Schultz had removed the western portion he met with strong resistance from the owners of Livezey House and was required by injunction to stop work. Later, at the insistence of the same family, he completed the project. 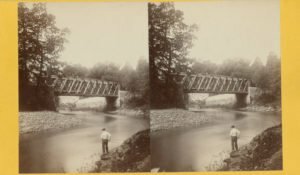 “Men and Things,” an unpublished paper available in the Fairmount Park historian’s file on bridges. Sarah West, “Forbidden Drive,” Friends of the Wissahickon Newsletter, Fall 2007. Conelius Weygandt, “The Pipe Bridge,” in The Wissahickon Hills. Philadelphia: University of Pennsylvania Press, 1930, pp 292-293. Main photo: Devil’s Pool Bridge and Shelter. David Bower Postcard Collection.